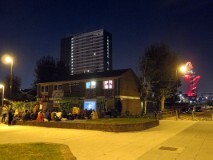 Friday’s film night at the E15 Open House occupation was a pretty special evening, with over 70 of us sitting in the square outside the occupied properties to watch and discuss two films which resonated across place and time (Poland in 2008 and Liverpool in 1973) to our struggles in London today. Above us the moon is shinning down in a clear night sky. A small, bright slice of nature – unmissably beautiful. And all around us poverty and wealth. Waste. Right in front of us is a tower block – 20 stories high. 10 flats on each floor. 1000 windows, but only 5 lights on. The dark windows mocking us – the empty flats sitting silent and cold and us locked out. Squat the lot! And then the bright shiny new towers and the red olympic spiral. People in there having dinner parties with no clue that just below them a group was gathering – struggle and love and connections were forming. A tiny seed growing in this unlikely landscape. So many times I have put on film shows to 10 lefties, or had brief conversations with people in housing need that go nowhere – and finally we are here. Together. It seems that tonight we can overcome all divisions – that a new and better world is truly possible starting with us. Other residents walking past see us – some come over and sit down, some stand at the back, watching and listening. Others look at us and keep going. They all saw it though. Saw a group of people caring about something. Trying something. Educating ourselves, discussing together, eating and drinking together outside. Socialising the square, socialising our situations, socialising our struggles. It felt like all those years paid off to have that one moment under the moonlight in a rundown council estate on the edge of the empty olympic park. One love. One fight.